Oxford, MS – Austin Peay State University’s softball team scored a season-high 14 runs versus Mississippi Valley, Sunday afternoon at the Ole Miss Softball Complex, as the Govs hammered the Devilettes 14-3, after dropping a 6-1 final to Nicholls State to open the final day of the Red & Blue Classic. The Govs (7-7) scored in every inning versus Mississippi Valley, starting with a RBI bunt single from Carly Mattson, followed by a perfect suicide squeeze by Christiana Gable for an early 2-0 lead. Mississippi Valley (2-15) would respond with three runs of their own in the top of the second to take its only lead of the game, 3-2, but Austin Peay responded with two runs in the bottom of the inning – including an RBI single by Danielle Liermann for a 4-3 lead. That would be all the runs that APSU starter Kelsey Gross (5-2) would need, as the freshman right-hander limited the Devilettes to just three hits over their final three at bats. Overall, Gross finished the complete-game victory giving up eight hits, while walking two and striking out three. The Govs would blow the game open in the bottom of the third, scoring five runs, including two scoring on a triple by Kacy Acree and two more on RBI singles from Gross and Emily Moore to extent its lead to 9-3. 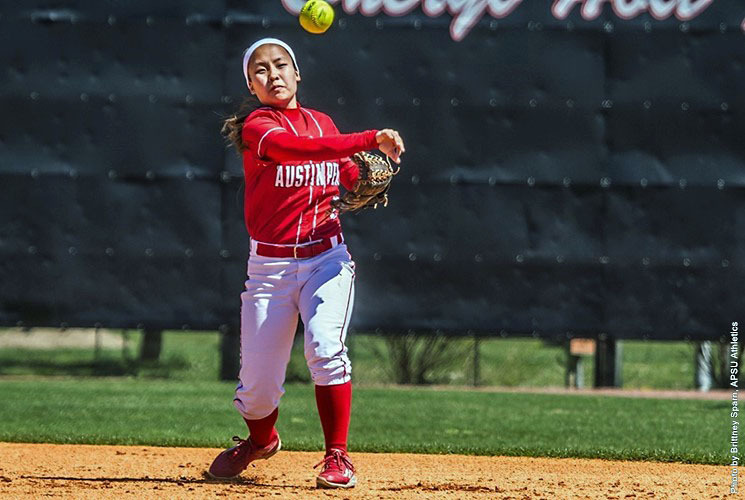 APSU would its final five more runs in the fourth inning, with two scoring on a single by Erica Inagaki and one each on an infield out by Acree and a single by Liermann for the 14-3 final margin. Inagaki, Acree, Liermann and Moore all finished the win with two hits each. In Sunday’s opener versus Nicholls State, the Govs got into an early hole by giving up five first-inning runs to the Colonels, with Nicholls State taking advantage of two walks and two APSU errors in the frame. The score would remain 5-0 until the top of the fourth inning, when the Govs scored their only run of the game on a home run just inside the left-field foul pole by Liermann – her third of the season. Liermann would finish the game with two hits, while Mattson and Kendall Vedder had the other two APSU hits in the loss. Nicholls State would close the game’s scoring with a single run in the bottom of the fifth for the 6-1 final margin. Austin Peay will return to action on Tuesday, when they host Campbell for a home doubleheader at Cheryl Holt Field, with the first pitch scheduled for noon.